It is just after 5:000am here in Bamburgh (say BAM-buh-Ruh or BUM-buh-Ruh) as we head out the door for our second trip on the gannet boat. Both Sunday landings were great and my weather Karma held for yet another day: more cloudy bright conditions. 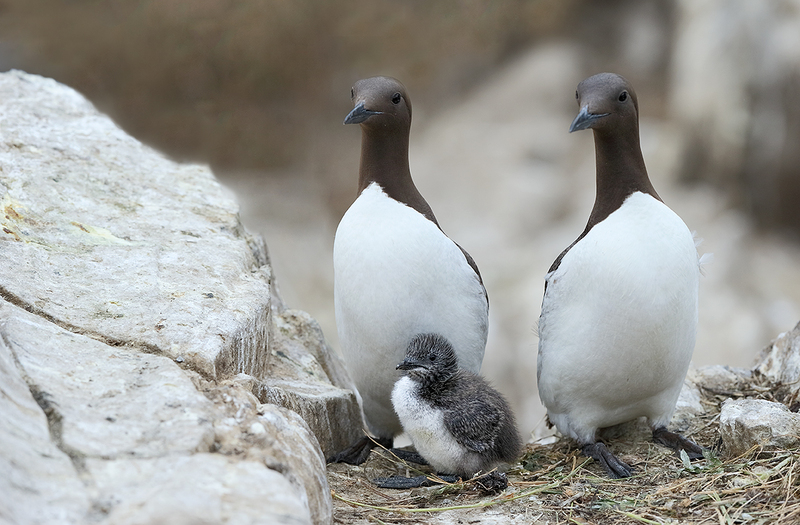 On the way to the islands someone asked me “What would you like to get today that you have not already gotten?” I responded quickly: “Landing and flying Common Guillemots (Common Murres on our side of the pond). Done deal. This post marks a ridiculous 219 consecutive days with a new blog post. With so many folks getting in the habit of using our B&H links and our Amazon logo-links why quit now? April, May and June have been fantastic as lots of folks are getting the message; using my affiliate links does not cost you a penny and helps support my efforts here. To show your appreciation, I do ask that you use our B&H and Amazon affiliate links on the right side of the blog for all of your purchases. Please check the availability of all photographic accessories in the BIRDS AS ART Online Store, especially Gitzo tripods, Wimberley tripod heads, and the like. We sell only what I have used and tested, and know that you can depend on. We will not sell you junk. We know the tools that you need to make creating great images easy and fun. And we are always glad to answer your gear questions via e-mail. This image was created on the morning of July 4th with the hand held Canon EF 300mm f/2.8L IS II USM lens and the Canon EOS-1D X. ISO 800. Evaluative metering +1 stop as framed: 1/1600 sec. at f/5.6 in Av mode. Cloudy White Balance left the image too yellow. One sensor to the left of the central sensor AI Servo/Surround/Rear Focus AF on the center of the upper breast of the adult on our left was active at the moment of exposure. Why was that a mistake? Click here to see the latest version of the Rear Focus Tutorial. Click on the image to see a larger version. 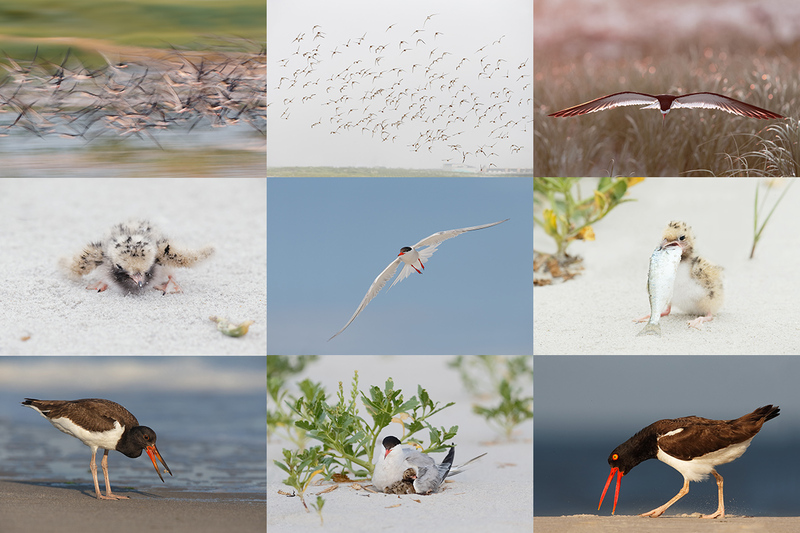 Photographing nesting birds at seabird colonies is a lot like photographing nesting herons and egrets at rookeries. The key is to find the best, often the only perspective that offers a clean line of sight to the nest and a relatively clean background. My style is to simply pass up obstructed nests or those with horrifically cluttered backgrounds. The key to finding the good situations is to move. Walk right, walk left Explore new areas. Once you find something neat, get higher or lower to see if you can eliminate one or more distracting background elements. Choosing the ideal AF sensor can help you clean up the background as well. And, as I did above, once you have something fairly clean and have acquired focus, be sure to take lots of images. That is especially true when there are multiple birds at a nest. Doing so increases your chances of getting a few images where all of the birds have good head angles. This is the original image from which the optimized image that opened this blog post was created. There was nothing out of the ordinary here. I used Click White Balance in DPP to eliminate the yellow cast. The big job here was cleaning up the BKGR a bit with Denise Ippotlito’s Protective Cloning on a Layer Techniques. I lightened the image with a Curves adjustment and, again as taught to me by Denise, ran a 25% layer of Auto Contrast to give the image some pop. I selected the faces and hoods of the adults and the whole chick with the Quick Selection Tool and then applied a Contrast Mask to that layer only. Please leave a comment and let us know what differences you see between the original and the optimized image. Canon recently released a new version of DPP, V4.0. It can be downloaded here. You will need to enter your 1D X or 5D Mark III serial number to start the download. I now have 4.0 on both of my laptops. While early reports are that it is significantly better in many areas than any previous versions, I was totally baffled by the interface. It bears no resemblance to any current version of DPP. Arash Hazeghi and I will be working on a DPP V4.0 RAW Conversion eGuide quite soon. It will require a separate purchase. V4.0 works only with 1D X, 5D III, 6D, and 1Dc images. Folks with older bodies (both pro-sumer and professional) will need to continue using previous versions of DPP. I recently updated to V3.11 and have been very happy with it. I was glad to note the addition of a Color Temperature slider: I had been suggesting that ever since I began using DPP about 2 years ago. The currently available version of the DPP Raw Conversion Guide is ideal for folks (like me) who use V3.11 or prior. Learn more here. Late Registration Discount: Call Jim weekdays at 863-692-0906 for details or call artie this SAT or SUN (6/28 or 29) only at 863-692-0806. Or contact us via e-mail. 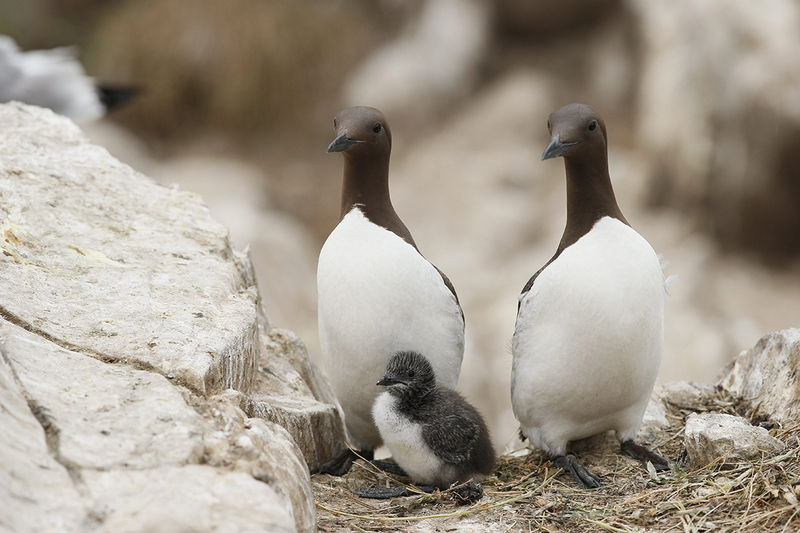 Much warmer tone to the second shot, the guillemots look quite chocolate coloured which is probably more accurate than most images you see. I should point out though that I haven’t colour calibrated this screen. The young ‘un doesn’t seem as sharp in the second picture, why is that? Thanks. And yes, the color balance in the optimized image is pretty much perfect. The second image is a JPEG that represents the unsharpened original. In addition, I ran a layer of my NIK 50/50 preset on the birds in the optimized image and lightened them as well. Learn all about color balance, color casts, NIK, and tons more in Digital Basics. Thanks Kevin. Good job and good question. That was the rear half of a Black-headed Gull in the ULC. As for the whitish feathers, that was a close call. Denise would have left them for sure. For me, the images is prettier without them. And there are lots of birds of this species without any whitish feathers on their chocolate brown hoods.